Ever since I was a kid, my favorite dream that didn't involve Farrah Fawcett in a red bathing suit had me running down the aisle of a TV studio, screaming like a banshee after hearing an announcer bellow "Jonathan Berr, come on down! You're the next contestant on 'The Price is Right!'" Now, my fantasy may become reality. The classic 37-year-old game show recently held a contestant search in the Philadelphia area. Because the event was poorly publicized and was staged at a car dealership 30 minutes from my house, I decided to take a shot at game-show stardom. But I knew I couldn't be the only person who daydreams of the Big Wheel and the Showcase Showdown. It was important to stand out from my fellow contestants; wardrobe, I decided, would be key. Because I'm a slacker journalist in real life, I decided to play that role for "The Price is Right," carefully selecting a loud Hawaiian shirt from my collection and cultivating a 5 o'clock shadow. I looked like a hipster. Or maybe like an extra from The Big Lebowski. Fashion is not one of my core competencies. Neither is self-promotion. I will think no less of the program's producers if I am not awarded a free trip to Los Angeles to sit in the show's studio audience for the chance to be chosen for a nationally televised audience. It's not clear when I will learn if I am one of the chosen few. 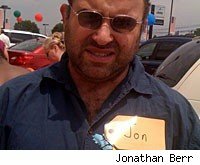 After I located the dealership amongst the dozen or so on the same stretch of highway, I got a name-tag and contestant number from someone who seemed to be an intern. The tags looked similar to those worn by members of the "Price is Right" studio audience. That was pretty cool. My fellow contestants seemed to come from diverse backgrounds. The man behind me in line had taken the day off from his job as an inspector for Comcast Corp (CMCSA). His son -- who must have been about 11 -- was playing handheld video games. The crowd was as diverse as what you'd find at the Department of Motor Vehicles, or at jury duty. There were blacks and whites, young and old. Some were rabid "Price is Right" fans; others, like me, hadn't seen the show in years. Much of the chatter in line was optimistic. Attendees mentioned their favorite "Price" games. (Mine is the one with the yodeling mountaineer.) Others discussed the "fabulous prizes" they desired: vacations, recreational watercraft -- and, of course, a brand-new car! Many of of them, I suspect, were under- or unemployed. The audition itself was not complicated: after handing in a form with my personal information, I was directed to a line to be videotaped, telling the CBS brass why I should be on the show. Oddly, I was not quizzed on the prices of various products, as I had expected I would be. You might assume the "Price" producers would want to know whether a prospective contestant is qualified to play the game. People who want to go on "Jeopardy" get quizzed on 19th-century French literature. But "Price" isn't "Jeopardy." The game isn't about how smart you are, or even how savvy a consumer. It's about how badly you want four days and three nights in sunny Acapulco (or, of course, a brand-new car!). I am sure there are plenty of smart economists who study the program for clues about consumer behavior. But for some people, this audition was no game. A woman of about 25, videotaped just before I was, explained (in a remarkably calm voice) to host Drew Carey and to the CBS brass that she should be on "Price" because she has had a rough few years after having been diagnosed with epilepsy. No way was I going to be able to top a sob story like that. Until I remembered that I was "playing" the eccentric journalist. After the camera began to roll, I quickly gathered my thoughts and proclaimed that "The Price is Right" is my last shot at daytime-TV stardom. I was unlikely to be cast as a soap-opera villain, I reasoned. I also said that I wanted to debate politics with Carey, who supported libertarian Rep. Ron Paul for president last year. After my 60 seconds were up, the camera operator gave me the thumbs up and told me I'd done a good job. One of my fellow wannabe contestants in the video snapped that she did not want to follow me. I was stoked. Game shows, I realized at that moment, are a lot like life. The people who really need to win don't even get to play.